Endangered sockeye salmon returns are good this season, but good numbers aren't the end of the story. "I can't remember the last time this many salmon came back ... [but] we're quite a way from the historic returns," said Pete Hassemer, anadromous fish manager with the Idaho Fisheries Bureau. 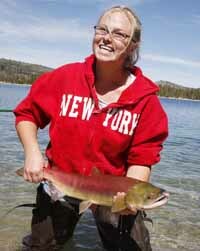 Sockeye returns to the Stanley Basin are expected to run in the range of 1,400 to 1,500 fish, up from last year's 833. The returns are well above the numbers of sockeye typically captured and transported to the hatchery on the Salmon River south of Stanley each year. As a result, this year 400 to 500 sockeye will be allowed to migrate naturally to Redfish Lake, where they spawn. This type of natural return hasn't occurred since 1990, due to extraordinarily low spawning runs. As recently as 2006, a total of three sockeye returned to Redfish. However, returns are predominantly made up of hatchery fish rather than wild fish, and drawing conclusions about salmon recovery from the runs can be tricky. "Probably 80 percent of the returning fish are hatchery fish that play only a temporary role in the recovery of wild populations," said Greg Stahl, spokesman for the Boise-based conservation group Idaho Rivers United. Wild sockeye numbers are the numbers that count when considering sockeye recovery. Idaho Rivers United has joined other conservation groups in calling for the removal of four dams on the Snake River, which conservationists say inhibit the endangered sockeye from reaching spawning grounds. In recent years, the Snake River dams' collective impact has been mitigated by four years of dam spills ordered by a federal judge. The spills, extra water that is run through the dams, help flush more fish over the dams. And more fish over the dams can mean better returns. "A not-insignificant portion of the returns can be attributed to the spill," Stahl said. Hassemer agreed that this year's good returns are likely the result of dam mitigation projects over the past few years. "A lot of them have been very recent," he said. "If we took an action to increase returns five years ago, we'd just be seeing the results now." Return numbers are based on the number of wild and hatchery fish, but only wild fish are considered when determining if an endangered species is recovering. Of the 833 sockeye salmon that returned to the Stanley Basin last year, 86 were wild. Stahl and Hassemer said they remain optimistic, despite the relatively low numbers of wild fish. Stahl pointed out that in 1992, only one wild sockeye returned to the basin. "You have a species functionally extinct 15 years ago, and you're seeing recovery become possible now," he said. Still, Stahl said, the dams are preventing further recovery, and are harming the fish far more than any habitat conditions. "Idaho's got habitat. What we don't have is the fish," he said. "We want to see wild salmon back in the Salmon River."